We had great services here in Phnom Penh again this morning. The auditorium was packed and the spirit was good. It was a blessing to have a new young man, Vuthy, visit the morning service. 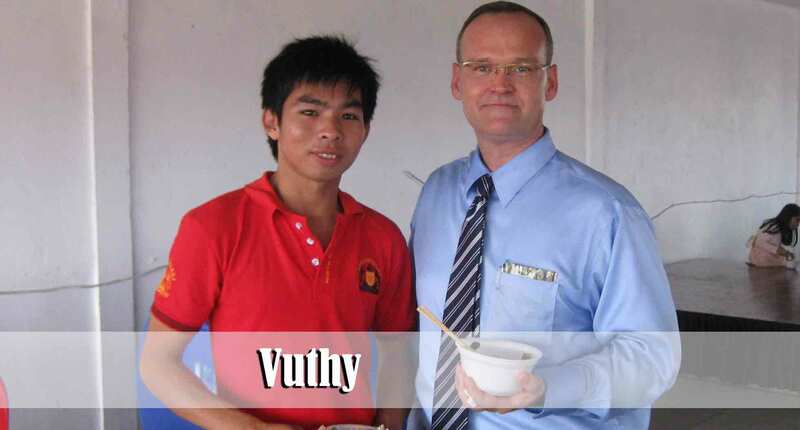 Vuthy recently graduated from university with a degree in Management. When I asked him who invited him to our church he indicated that no one had invited him. He just moved to our neighborhood and saw the church and decided to come. He indicated that he has been a believer for 4 years. Pray that our young adult men will get close to him and that we will be able to see him get plugged into the ministry. He returned for the evening service as well. After the morning service, once everyone has cleared out of the auditorium, some of us set up for the Children’s Ministry service while other folks go into the community to make some visits. Today as I was “managing by walking around” (making sure everyone was doing what they were supposed to be doing) I stopped to chat with SreyKa, SreyPouv, and Somphous. They were all three busy sweeping the auditorium and setting up for the next service. 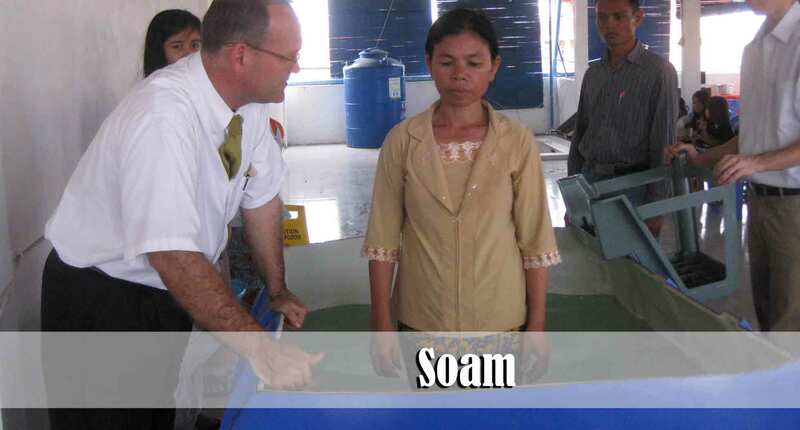 Somphous told me, “Pastor, SreyKa wants to accept Jesus as her Saviour. Can you help her?” I had never met SreyKa but the four of us sat down on one of the mats and I explained salvation to her. She said that her children’s class teacher, Mrs. Bounna Has, had taught her about salvation and she was ready to believe. Right there on the mats she bowed her head and told Jesus that she was a sinner, could not save herself, and believed that He had paid the price for her sin and asked Him to please forgive her sins and take her as His child. That was a blessing. 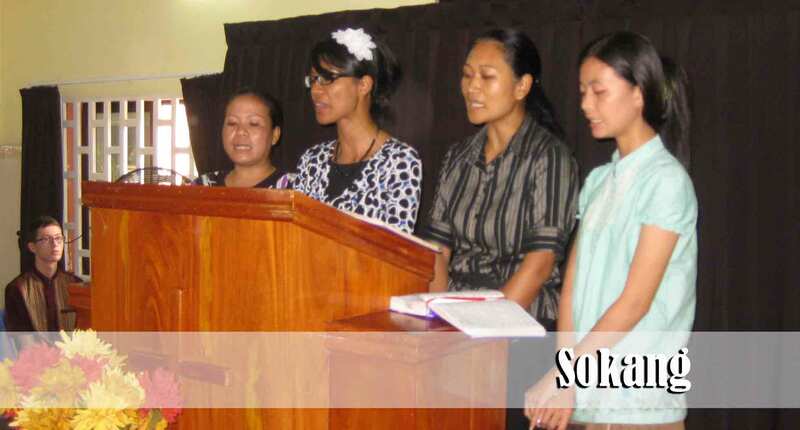 Somphous and SreyPouv were very excited because they have been praying for her and encouraging her to come to church. Thank the Lord for young children who have a heart for the lost around them. Mark 10:15 reminds us that if we are going to be saved, we must also have the faith of a child who is willing to take God at His Word and receive Him in simple faith. 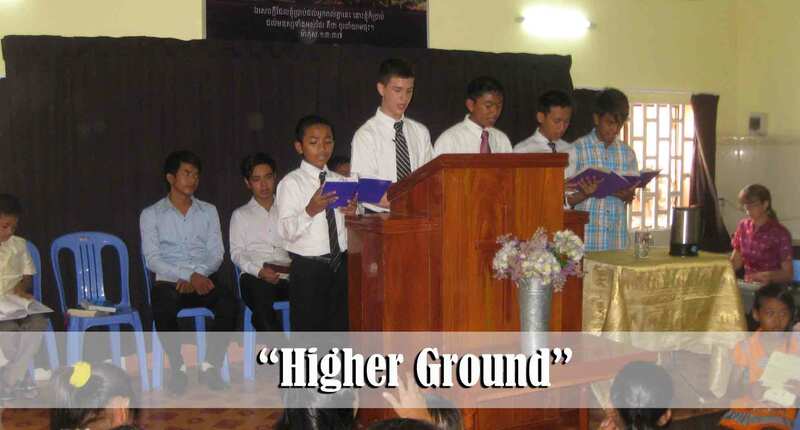 We plan, Lord willing, to have our first Youth Conference here in Phnom Penh this next Sunday and Monday. We were supposed to have it last week but chose to postpone it due to the political protests that were going on here in the city. 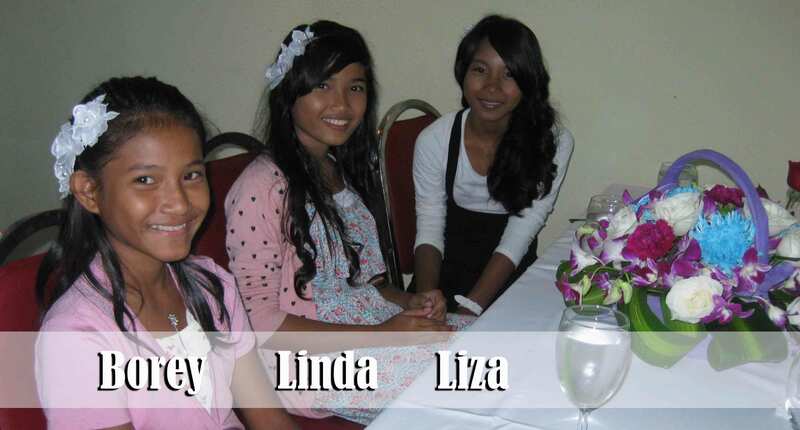 The conference will be primarily geared toward the faithful teens, like Borey, Linda, and Liza, who are a part of the Phnom Penh church. 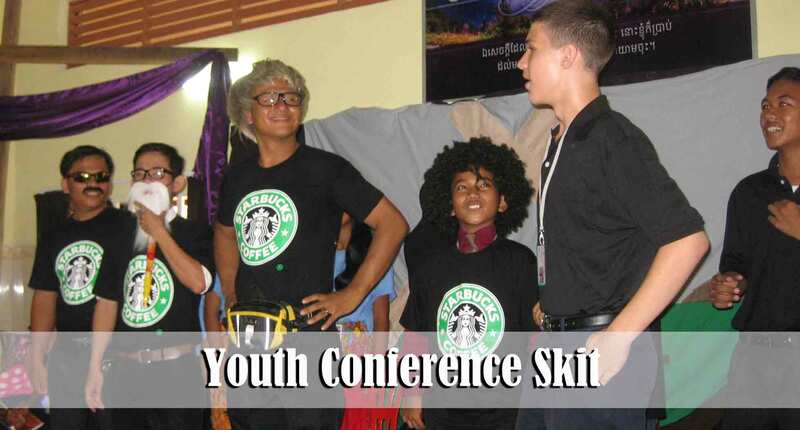 The village churches in Anlong Tnout and the Prey Bang church will send their teens as well. However, we are also inviting teens who faithfully attend our village works (works that have not yet become a church) in Trabang Tma and Prak Pnou village. We anticipate having Hang, (16 years old) from Lawgombou village, attend as well. We have been reaching out to his family for the past several months. They are not saved as of yet but I believe they are opening up to the gospel. Please pray that our teens will have safety traveling from the various villages here to Phnom Penh and that the conference will be used to challenge them to be a bright light in their community as well as maintain a close walk with the Lord. The next couple of weeks are a “slippery” time for many of the new believers who have been delivered out of Buddhism. The Pjum Ben festival is the first week of October and is one of the most important festivals here in this country. It is a time of devil worship and ancestral worship. In reality, it, along with ancestral worship in general, is likely the single most significant stronghold that Satan has on this culture because of the fact that it incorporates ones familial responsibilities with occultic practices. It is a yearly thing that we have faced with the Khmer people since we first began winning the Cambodian people to Christ back in 1984. New believers will be faced with a decision to go to the temple and participate with their families or to stand alone. This evening one of our young men said to me, “Pastor, will you please pray for me? I am worried that my parents will try and force me to participate in Pjum Ben and I want to be faithful to God.” Please pray for our new believers to be strong and trust in the protection of the Lord during the next couple of weeks. It was a blessing to have Vannak and Samantha joined together in marriage yesterday morning. I don’t know if I’ve ever known a finer Christian couple than these two. During the wedding ceremony we gave them both an opportunity to publicly share their testimony of faith in Jesus Christ. 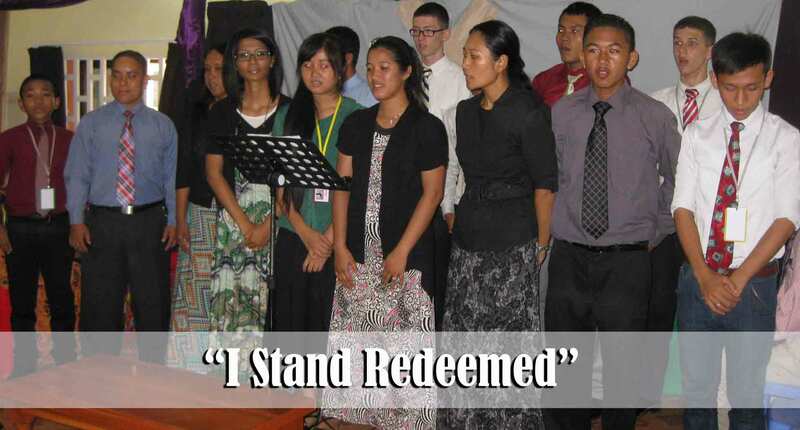 Vannak boldly shared of his resolve to continue serving the Lord with his whole heart. This couple has so much potential for the Lord; they are teachable, humble, dependable, energetic, both of them are soul-winners, and now they can serve the Lord together. Their courtship was Christ honoring and a wonderful example to the young adults in our church. It was a blessing to us all to see them in the morning service today. They put off leaving for their honeymoon because they did not want to miss church. 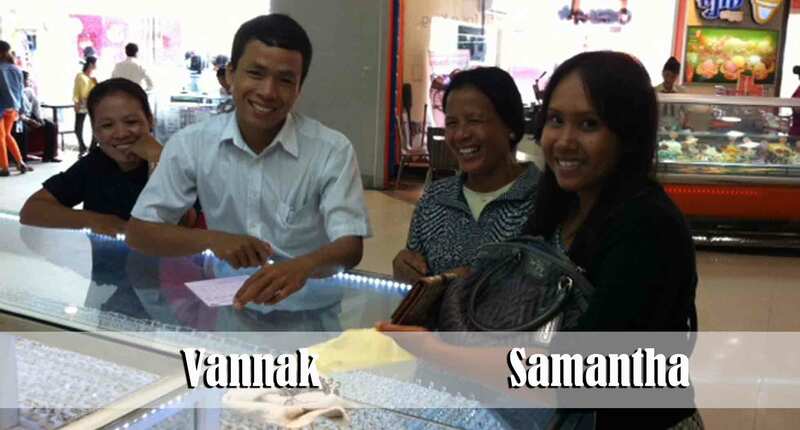 Please pray for Vannak and Samantha to continue to be faithful to the Lord and to His work. It was a blessing to be able to fellowship with Vannak’s grandmother at the wedding. She lives in the Cham village two hours from the church. She is a part of our Anlong Tnout village church. After grandma got saved her whole attitude changed. I remember how 7 years ago she would openly mock me as I taught in the village but now God has done a great work in her life. Yesterday I told her that her eyes were bright. She replied, “That is because of the new life that Jesus has given to me!” Thank you for continuing to pray for the Cham believers. You may recall that several months ago we requested prayer for Soam. 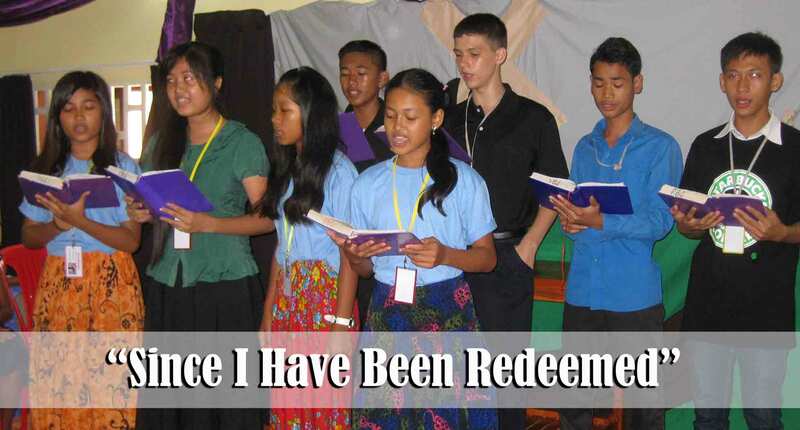 As a new believer she was undergoing serious persecution by her lost husband, Hem. 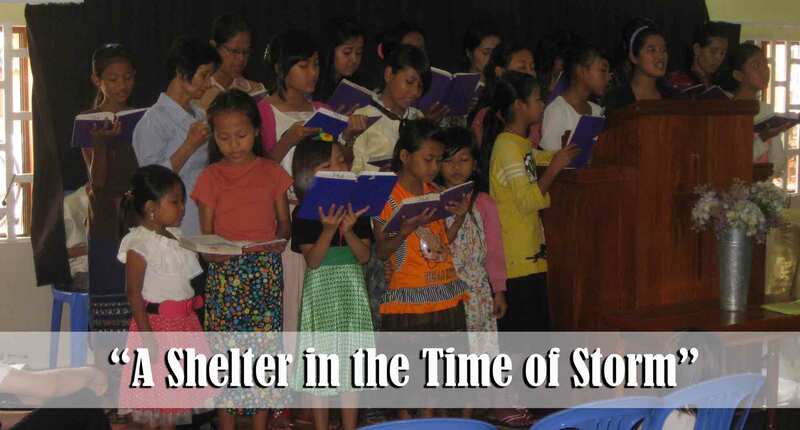 For a time she sought refuge here in Phnom Penh with the believers because of specific threats that were made toward her due to her refusal to renounce her faith in Jesus Christ and return to Islam. I remember her telling me, “Pastor, I can not abandon my faith. If I do, I know for sure that my husband and family will never be saved. I have to go forward for Jesus.” It was a blessing to see her husband, Hem, attend the wedding yesterday here at the church and then the reception afterwards. This is huge! I am certain that it took a lot of courage for him to do so as he likely assumed that we would all look down on him. Praise the Lord that everyone was loving toward him and very welcoming. I do think that God may have used the wedding to work in his heart and soften him to the message of the gospel. Please pray that Hem will be saved! Perhaps he will become like the Apostle Paul who once persecuted the church but who came to become a child of God who boldly proclaimed the good news of salvation! If we can help you in any way please don’t hesitate to let us know. We always are encouraged to hear how you are faithfully praying for the work here in Cambodia! We had great services today at Pacific Baptist Church! The spirit here in Phnom Penh this morning was uplifting, exciting, and enthusiastic. There was standing room only! There is just something special about hearing an auditorium that is jam-packed full of people singing from their heart to the Lord. This morning I continued in our series from 2 Peter with a message entitled, “How Then Ought We To Live?” based on 2 Peter 3:11, Seeing then that all these things shall be dissolved, what manner of persons ought ye to be in all holy conversation and godliness. Lord willing, we will finish the book of 2 Peter next Sunday. This morning four of the ladies sang the hymn “The Cleansing Wave.” Sokang and her husband, Taiwan, have been saved for almost two years now. It is exciting to see their faithful walk with the Lord and their faithfulness to the ministries of the church. Last night at our men’s weekly Discipleship accountability group Taiwan shared some specific areas of Christian stewardship in which Sokang has recently grown. He shared how blessed he is to have a wife who is willing to trust God and take Him at His Word. I know that God has something special for this fine young couple. It is a blessing to help lead new believers who are willing to simply step out, by faith, and trust God to provide for them. Brother Keo and some of the workers travel with Taiwan to his village every Wednesday afternoon for soul-winning and Children’s Ministry. There are currently some very good adult prospects in that village who seem to be close to salvation. Please help us pray for Ta Skov village in Kandal Province. 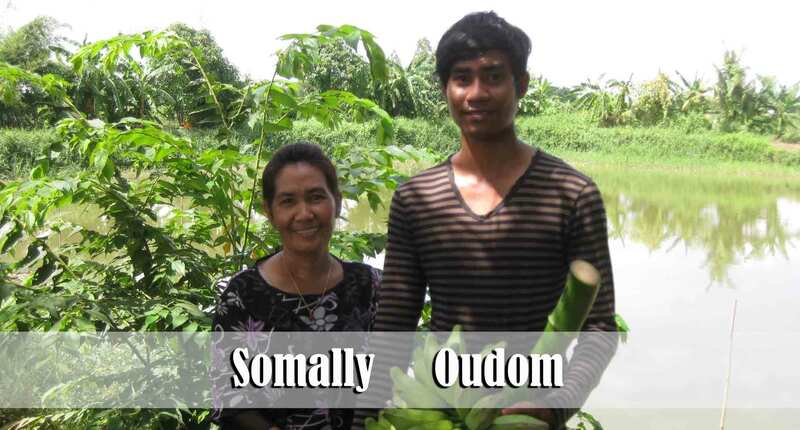 Rom is the husband of the lady, Srey, who passed away last month. Rom’s daughter, Borey, is not able to live with him because of issues in his life that make it unsafe for her to do so. She is now living with one of our members. Pheap is Rom’s friend. They work together, live together, and for the past two Sunday mornings have visited our services together – drunk. I know that it was embarrassing for Borey to have her father in the services like that. Thankfully our people have a heart of compassion for these two men and have not made Borey feel uncomfortable. I, and others from our church, have sought on several occasions to witness to Rom but have never been able to find him sober enough to comprehend the Gospel. This morning it appeared as though they both had sobered up by the time preaching time came and they seemed to listen intently. Please help us pray for these two men to be saved. If Rom would trust Christ and his life became a testimony in this community, it would be a wonderful thing! This evening we had a missionary from our home church in Long Beach visit the service. She will be here in Cambodia with us for 9 days. She is serving with a group of missionaries from Long Beach in a “creative access” country. I asked her to share a testimony regarding what it is like to try and win souls in a country where you are closely watched by a government that hates Christianity and that forbids you to teach nationals the Word of God. Even with all the turmoil that is currently going on with the political situation here in Cambodia, our people here can certainly praise the Lord for the amount of freedom that we all enjoy here in this country. Please pray for the missionaries serving alongside of this young lady as they win souls and help to train nationals for the cause of Christ. We had a wonderful service this evening that was filled with singing, sharing testimonies, updates from three of our village works, and preaching from three of our laymen. We have begun having a special Sunday evening a month where we have three different men preach. We understand that the key to reaching a country is in winning and equipping nationals to do the work of the ministry. I reminded the church this evening that God is looking for faithful national men and women who will reach this country. 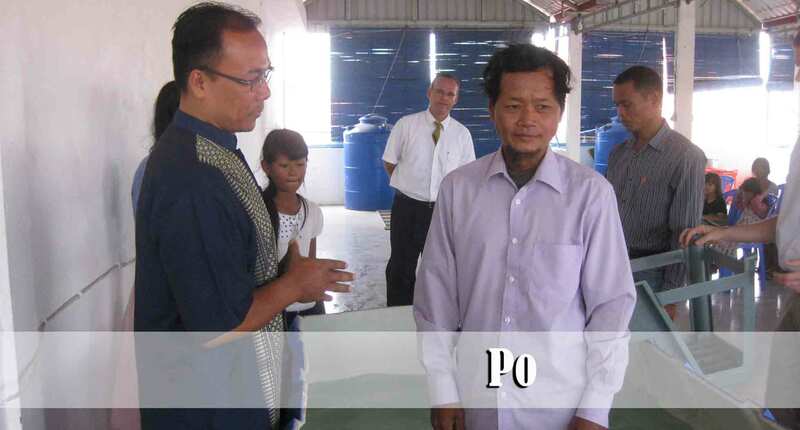 We try to practice this Biblical philosophy of ministry through everything we do here in Phnom Penh, and God is blessing, in part, because many of the national believers are owning the vision for their own people. 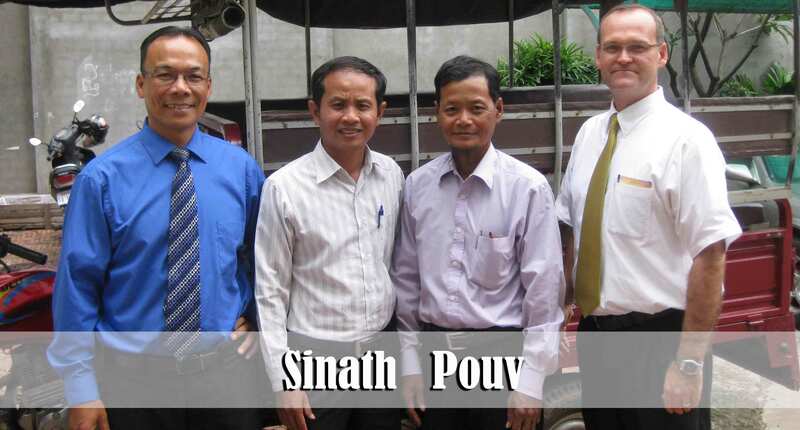 Sinath, Vannak, and Maldy are all students in our Bible Institute. All three of them are faithful men who devote many hours each week to winning and discipling folks in the villages. This evening Sinath preached a message entitled, “Travailing in Prayer for the Lost” taken from Isaiah 66. Vannak preached a message entitled, “God Carries Us Along” taken from Isaiah 46. Maldy preached a message from Luke 23 entitled, “Don’t Weep for Me. Weep for Yourself.” All three of these messages spoke to our hearts in a powerful way. 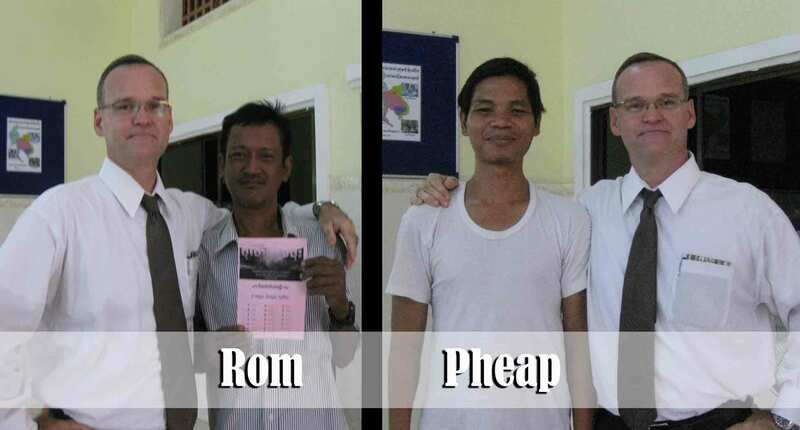 If you have prayed and supported our work you have a part in the spiritual development of these three men, their families, and many other folks here in Cambodia. Vannak will, Lord willing, be married this next Saturday here at the church. It was a special blessing to have him meet with me this past week and request permission to start a new discipleship group in one of the villages targeting teens. He has a vision to draw teens from three different villages (including the Cham Muslim village) and invest additional time in them each week. It is a blessing that he understands that soul-winning is just the beginning point of the Great Commission. Please help pray for Vannak, his soon to be wife, Samantha, and this new outreach to the teens in Trabang Tma, Swi Pím, and Anlong Tnout villages. We look forward to giving you more information about this new ministry in the months to come. We recently renewed contact with some old prospects. As the Bible tells us, sometimes people seem interested in the Gospel for awhile then as the cares of this world take over, they lose interest. However, the seeds of the Gospel have already been planted and God continues to try and draw them to Himself (John 6:44) through the truths they read and heard. Within the past two weeks both of these families have called me and expressed an interest in knowing more about how to be saved. 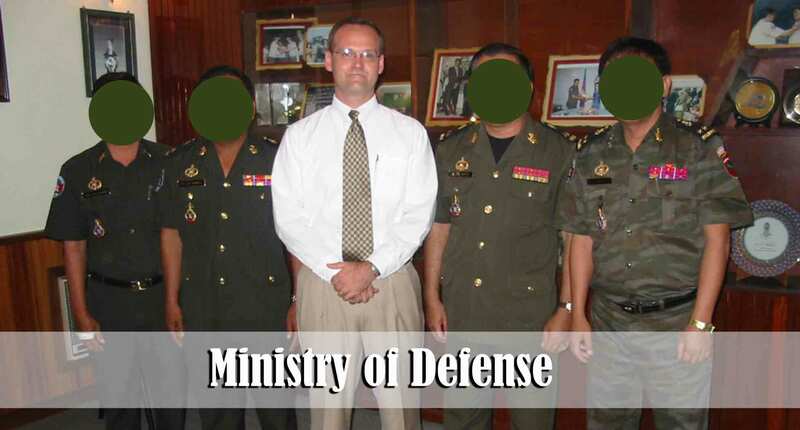 Please help pray that 1) We will be faithful to pursue them, 2) That Dara, Sokha, Sreang, LeHooat, and Srey Neang will respond to the truth and be saved. Our ministries here use a lot of Gospel tracts. We have seen that God honors our efforts and His Word as it is placed into the hands of thousands of people each month. Bro. Bounna Has wrote our latest tract entitled, “What If…” Missionary Sara Vong (www.thevongfamily.com) designed the very attractive cover. It is a tract that challenges the reader to seriously consider the consequences of believing a lie – especially in light of the fact that your eternal destination is determined by what you believe in regard to Jesus Christ. Please help pray that this new tract will be just another effective tool to be used by the soul-winners to see many come to salvation. We now have 4 basic tracts that we are effectively using here to spread the Gospel message. 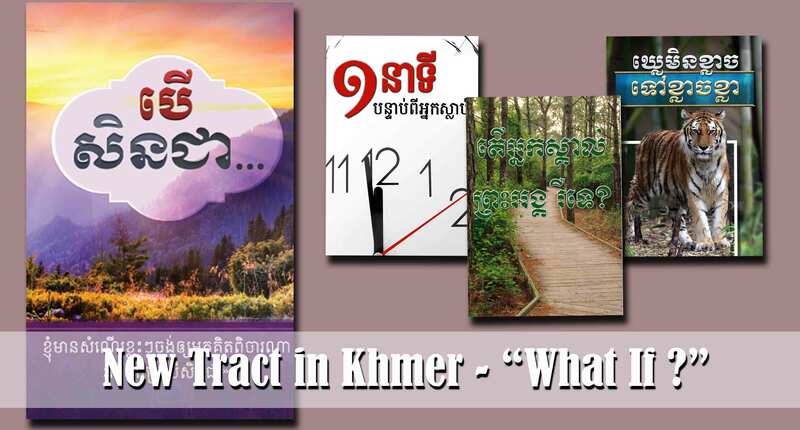 Lord willing, I will complete another new tract in the next few weeks entitled, “Born, Old, Sick, Die…then what?” This tract is based on a common saying in Buddhism with which every Cambodian is familiar. 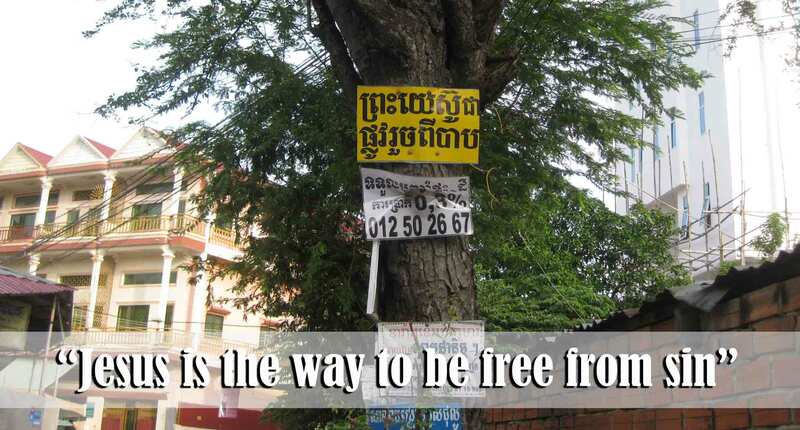 The title doesn’t make much sense in English but makes perfect sense in the Khmer language. If you would like to have a part in helping to pay to print these tracts please let me know. Today Chinese people all around the world took part in a festival known as the Mid-Autumn Festival. 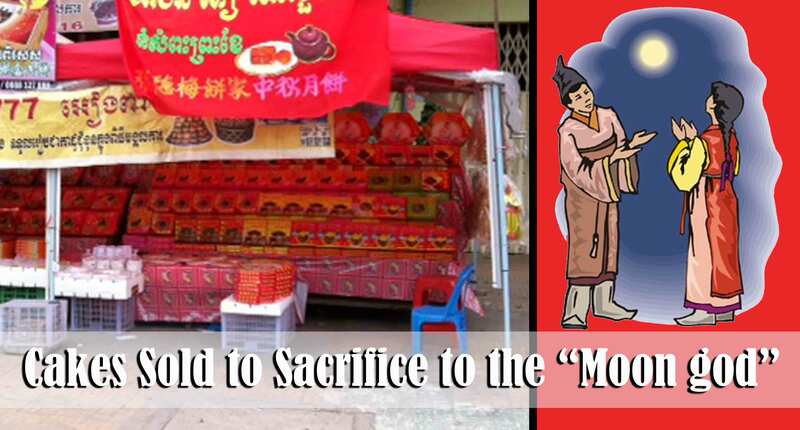 While it is a time for family and friends to gather together, it is primarily a pagan festival that is dedicated to the worship of the “moon god.” Moon cakes, like the ones in the picture, are being sold all around town. Today I made reference to the festival during my morning message and asked for a show of hands as to how many of the folks used to participate in this festival. Over half of the congregation raised their hands. It is interesting to note that the pagan practice of worshiping the moon (and sun) goes back thousands of years. It was one of the abominable practices in which the children of Israel learned from the heathen nations around them and in which they engaged themselves. We see reference to this practice in Jeremiah 7:18 which says, “The children gather wood, and the fathers kindle the fire, and the women knead their dough, to make cakes to the queen of heaven (the moon), and to pour out drink offerings unto other gods, that they may provoke me to anger.” We thank the Lord for His power to break the bonds of pagan idolatry in the lives of the Cambodian people. We are well into rainy season here in Cambodia. 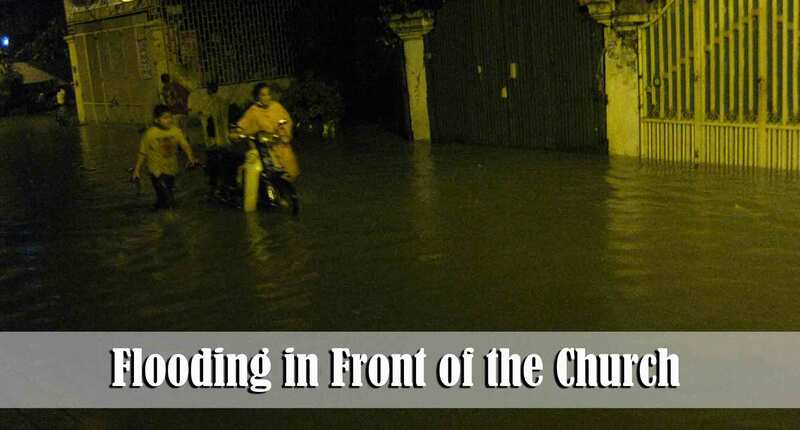 This past week our Children’s Ministry in Prak Pnou had to be relocated because of the fact that the river had risen and flooded the land where we meet each week. I took this picture this past Tuesday night at about 10:00. This is right in front of our door. Thankfully the property we are renting is about two feet above the street level and so our house did not flood. The water directly in front of our door was about a foot and a half deep. 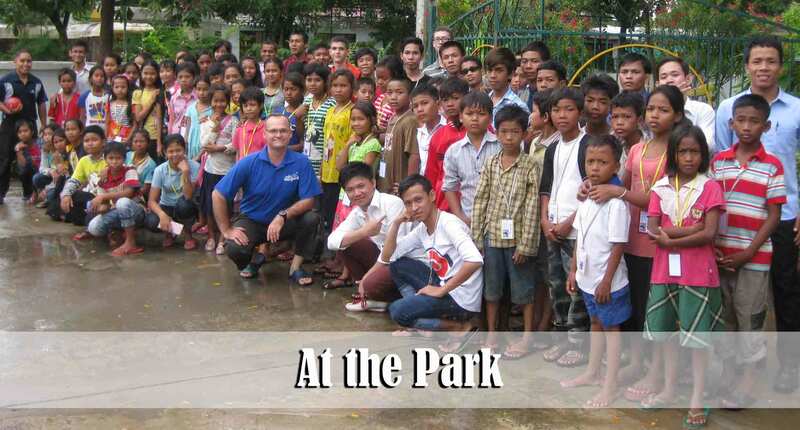 Thank you for your prayers and interest in the ministry here in Cambodia. If we can help you in any way please feel free to contact us. 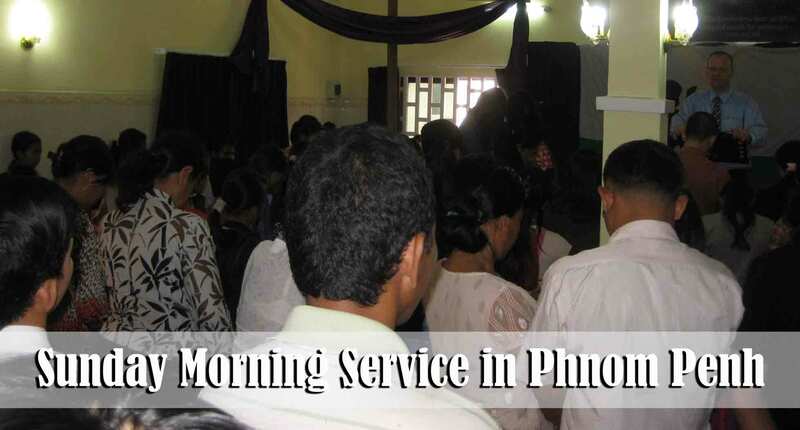 We had exciting services here in Phnom Penh today as well as in two of the village churches. This morning I preached on the topic The Patience of God from 2 Peter 3:8-9. 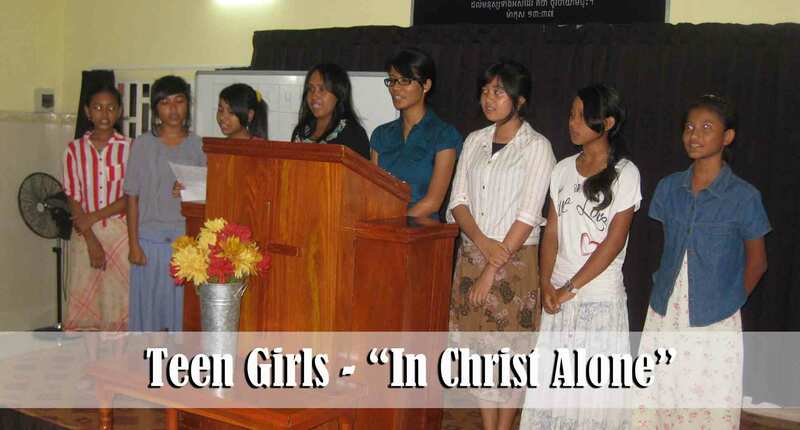 Some of the teen girls sang the song “In Christ Alone.” They did such a good job that we asked them to sing it again for this evenings service. This evening Bro. Bounna Has preached a great message entitled “I Am A Christian.” Each of his 15 points reminded us of what it means to be a true follower of Jesus Christ and not just a “Christian” in name only. 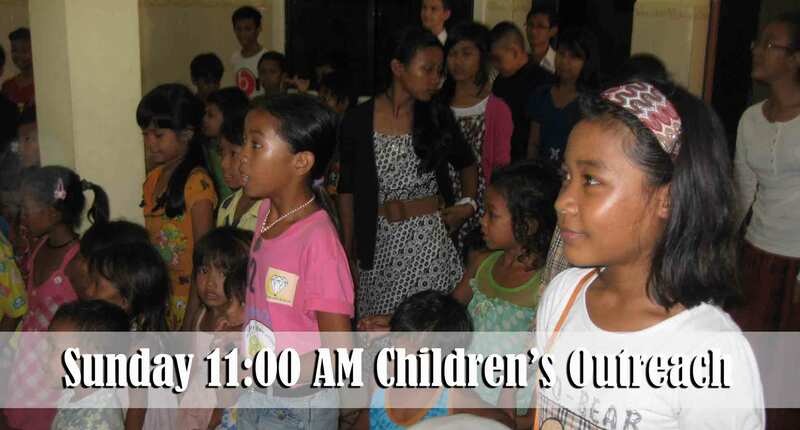 We continue to have an 11:00 outreach to the children who live around the church here in Phnom Penh. A few months ago, for several reasons, we had to down-scale the number of children that we bring to the premises at any given time. We divided our Phnom Penh Children’s Ministry into three different teams and we are only able to have one team come at a time. This morning Team Emmanuel had about 20 first time visitors. It was fun to see the excitement on the children’s faces as everything was so new to them. The workers are doing a fantastic job of showing the love of Christ to these children. We believe that the seeds that are being planted in the lives of hundreds of children each week here in Phnom Penh and in the various village ministries will one day reap great dividends. Many of you in the United States have heard me tell SreyMar’s story. As a 19 year old university student in 2007 she used to attend our church. Debbie invested many hours into her life teaching her how to be saved. We had very high hopes for her and her brother, Tola. One day she came to our house crying. She returned her Bible to us and told us that her mother forbade her from being a Christian. We encouraged her to at least accept Jesus as her personal Saviour even if she was not allowed to attend church and be around our family. She said that her respect for her mother and father was too strong and she could not disobey them. That was May of 2007. In June we moved. Around July or so she began having second thoughts and went to go find us intending to accept Christ regardless of what her parents said. However, much to her dismay, we had moved and she was unable to make contact with us. According to her own testimony she has been searching for us online for the past 6 years but because she did not know our last name she was unable to find any reference to our family online. She is now a college graduate and works full-time at the Phnom Penh airport. She regularly meets Americans who fly in and out of the airport. She shared how that she has asked scores of Americans (in the airport) if they know “teacher Dave and Debbie” from America… of course no one did. She began praying that IF God is real to please bring “teacher Dave and Debbie” back into her life somehow. Fast forward to August 2013, just three weeks ago… We had no contact with her since 2007 and as far as we knew she still wanted nothing to do with Christ. I had told her story many times in various conferences in the States. I had even shared her story in our various churches here in Cambodia. I often use her as an example of someone who is willing to die and go to Hell because they fear man more than they fear God. Three weeks ago, while returning back to Phnom Penh from Prak Pnou village, for some reason I had the impression that I ought to go try and track her and her brother down. I now believe it was the Holy Spirit Who impressed me to seek to renew contact with this family. I assumed that her parents still disliked us and what we represented. After doing some asking around I was able to find her house and went to go meet her family. SreyMar and Tola were both at work but her parents were home. Her mother immediately invited me into the house and told me over and over that her children missed me and have been trying to find us. I actually thought that she was making this up so as to not cause me to “lose face.” So I thanked her for speaking with me and proceeded to leave the house. She quickly followed after me and asked for my phone number insisting that her children would want to speak with me. A couple of days later I did receive a text message from SreyMar telling us how happy she was that we went looking for her. I did not pay the message much attention. Then last week our family had occasion to be at the Phnom Penh airport so I texted her and asked if she was on the premises because we would like to say hi to her. Unfortunately she was off that day but she promised me that she would see us when we returned from our short trip. So we told her that would be fine and we departed for a family trip to Bangkok, Thailand. Thursday afternoon as we disembarked the airplane in Phnom Penh, sure enough SreyMar was waiting there standing in the VIP section with a sign saying “Welcome Dave and Debbie.” It kind of caught us by surprise because we did not expect to see her. She immediately began sharing her story of how she has been looking for us for all these years and she even began praying that God would show Himself real to her and bring us into her life once again. With tears in her eyes she said, “I always heard you say that God is real and that He has power but I never thought He would show His power in MY life. I thought He would only show Himself strong in the lives of others. God is real! He answered my prayer! He answered my prayer!” WOW! To make a long story short – We are so blessed and excited to be able to report to you that SreyMar accepted Jesus as Her personal Saviour this afternoon in our home with Debbie. She was in the service this evening and was the first one to raise her hand during the time in our service when we share blessings. She said, “Today is a very special day for me because I became the child of God!” Many folks in our church already knew of her because they had heard me tell her story on more than one occasion. I’m reminded of some lessons because of what has happened with SreyMar: 1) Plant as many seeds in the lives of others as you can. You never know the effect that those seeds will have in their life. 2) Be sensitive to the impressions that God places upon your heart. So many times, I believe, God impresses upon us that we ought to call someone, write a letter to someone, or somehow make contact with them – but many times we do not obey those promptings. What if I had not obeyed the prompting of the Holy Spirit that afternoon? 3) It is God Who is good and not us. I have to admit that, if I remember right, I didn’t have the best attitude as I was driving back from Prak Pnou village that day. I don’t remember all the details but I do remember that things were not going the way I wanted them to go with our outreach that day. Aren’t you thankful that God has not chosen to use only the perfect people – who have perfect attitudes… Please pray for SreyMar and her spiritual growth. 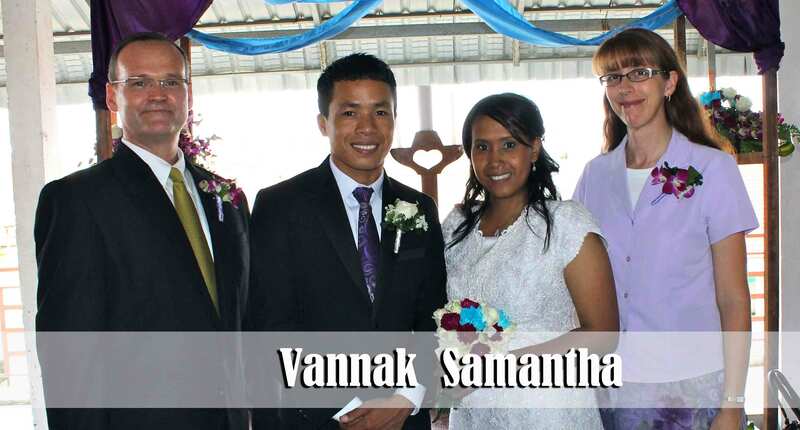 Vannak and Samantha will, Lord willing, be joined together in marriage at the end of this month. 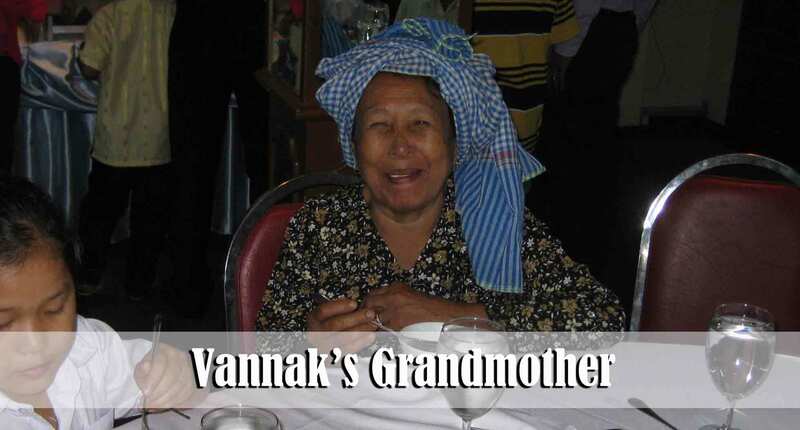 I had the privilege to lead Vannak to Christ back in 2006. God has truly done the miraculous in his life. He has a strong and fervent testimony in the community and is a committed soul-winner. I believe that his testimony is partially responsible for many of the Cham folks coming to Christ. I don’t think I know a better lay-preacher than Vannak. Samantha was reached through our home church in Long Beach. California. 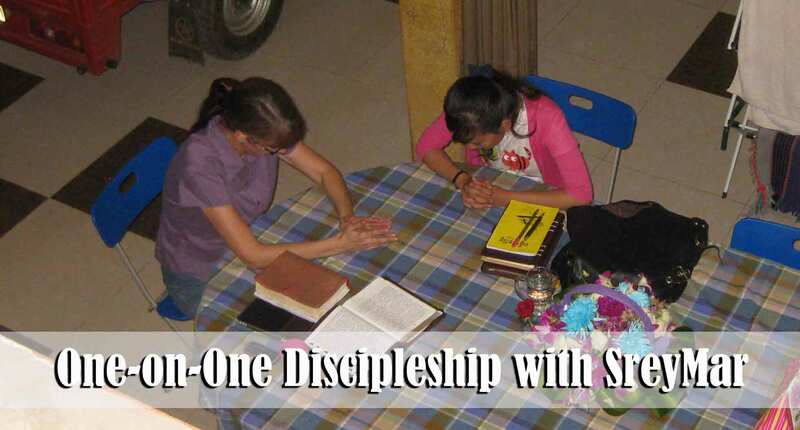 After Bible college she surrendered to follow the Lord wherever He would lead her. He led her to come serve along side us as a single lady missionary. Samantha’s love for the Lord and her compassion for her people is truly remarkable. 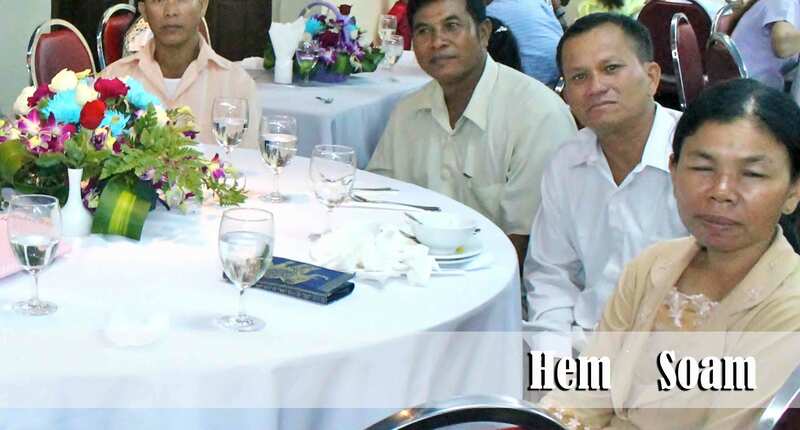 Though Samantha is of Cambodian decent, because she is from the United States she is considered to be a foreigner and the process to get married to a Cambodian national is somewhat more complected. We praise the Lord for their patience and Godly testimony to the church and in the community as they have diligently sought to jump through all the hoops that the government requires in order to be officially recognized as a married couple in this culture. Their paperwork is due to be completed early this week which means that we are now free to begin planning the wedding. This afternoon I had the opportunity to accompany Vannak and Samantha along with Vannak’s mother and aunt to the mall and help them pick out wedding rings. We will begin premarital counseling this Friday morning. Friday afternoon we will have the official engagement. It is Vannak and Samantha’s dream to serve the Lord right here in Cambodia for the rest of their lives. 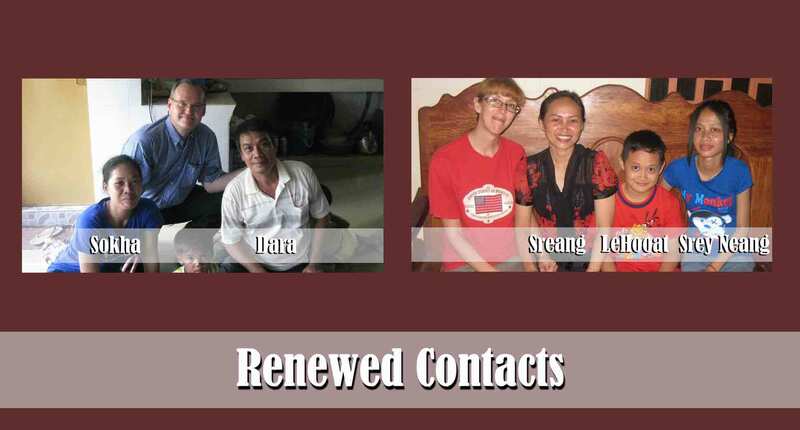 After he is married Vannak will begin a one year process of preparing to be ordained to the ministry. God’s hand of blessing is evident on this young couple. Please pray for Vannak and Samantha to continue to maintain a strong testimony in the days leading up to their wedding day. I will not say much about the current political situation here in Cambodia. Suffice it to say that rumors abound as to various scenarios that could possibly play-out within the next week. Elections were held several weeks ago but the results are being contested. 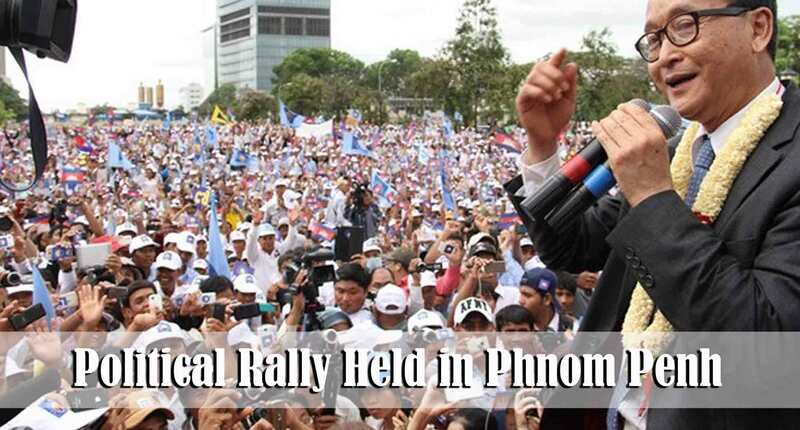 The leading opposition party has publicly announced they are calling for mass demonstrations (protests) here in Phnom Penh this coming Saturday. Apparently the government does not have confidence in the loyalty of the army here in the city and are perhaps fearful that some would like to “jump sides.” Last week it was reported that many soldiers from the city had their weapons confiscated by the government. It has been reported that many troops are being brought in to the city from outlying areas under the belief that they are more loyal to the ruling party. Saturday, as I returned from the village, I saw, first hand, military vehicles at the edge of the city. 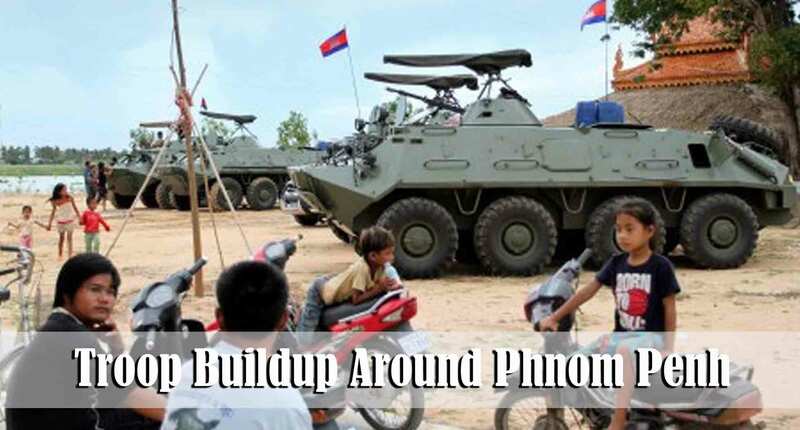 At our Saturday evening men’s discipleship group one of the national men reported that he had seen many large Armored Personnel Carriers at the other edge of town as he was returning from doing ministry in a different village. We don’t know exactly what will happen but we know that everything is in God’s hands. Please help pray that peace and sanity will prevail and that all of our people will remain safe. It is possible that we will not be able to leave the city to head out to the village works, or even leave the general vicinity of our property this next Saturday due to the fact that much of the city could be under curfew. 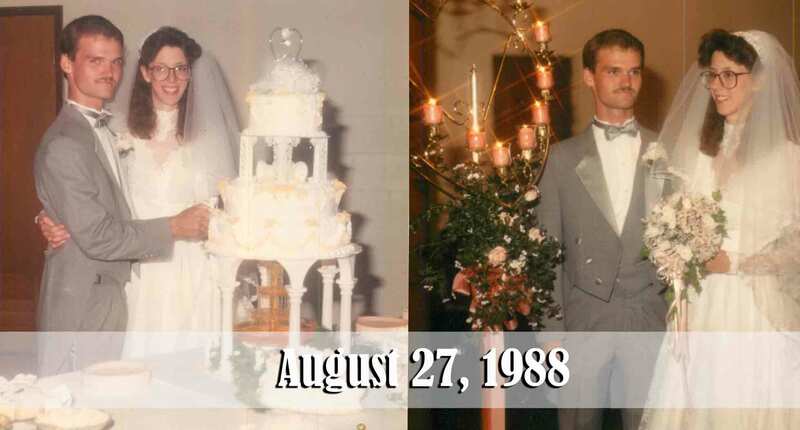 This past week we celebrated our 25th wedding anniversary. I am so blessed to have a wife like Debbie. If I had the opportunity I would marry her all over again! 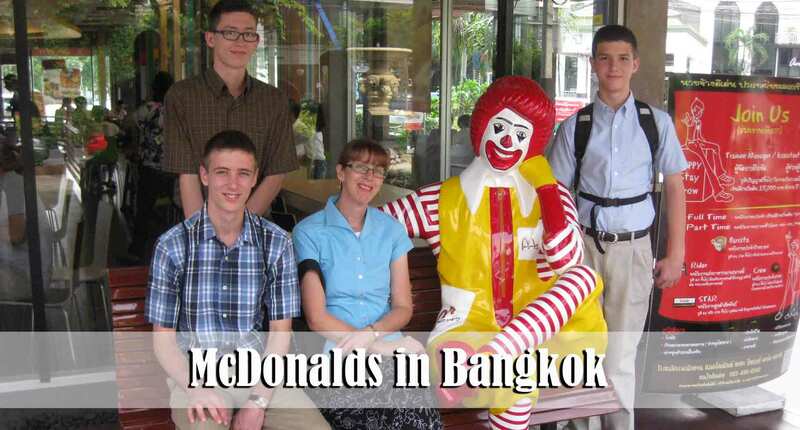 We were able to get away and take a short family trip to Bangkok, Thailand. Although three of us got seriously sick (two of us went to the hospital) we still had a great time. 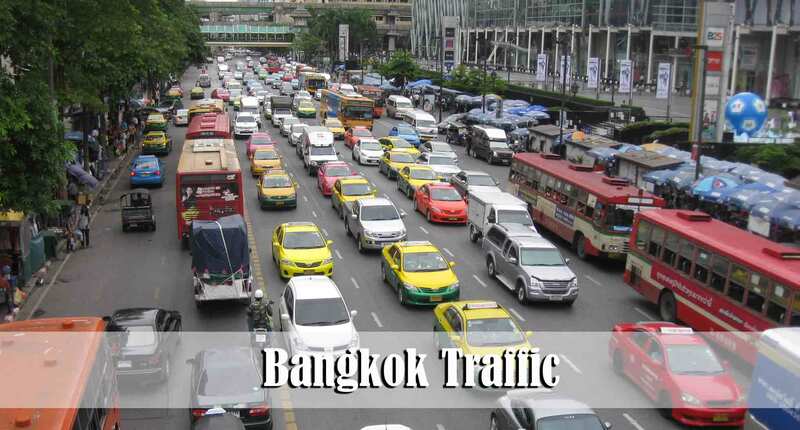 The city of Bangkok has anywhere from 10-12 million residents depending upon where you draw the city lines. It is huge! We were able to stay at a Christian guesthouse located just about a minute walk from public transportation. We had fun riding the electric train and the underground shuttle. The boys also enjoyed eating at McDonalds. The shopping malls in Bangkok make the malls in America look like a cheap strip mall. We walked around many of the malls although we did not buy anything. Many of the malls are 5-8 stories tall and are packed with thousands of people. One of the malls we entered sold Rolls Royce and Maserati cars right there in the mall. 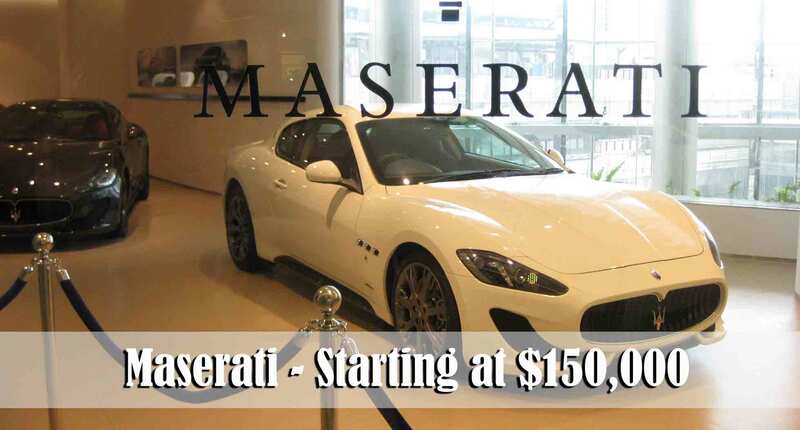 It is very evident that the god of materialism is alive and well in Bangkok! One of the interesting (and sad) things that we witnessed was how committed the Thai people seem to be to Buddhism and ancestral worship. 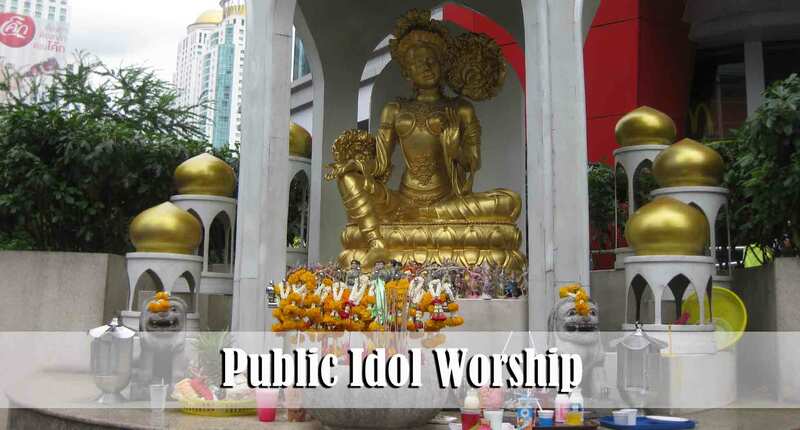 It is a very common site to see huge idols on the corners of streets right in downtown Bangkok. 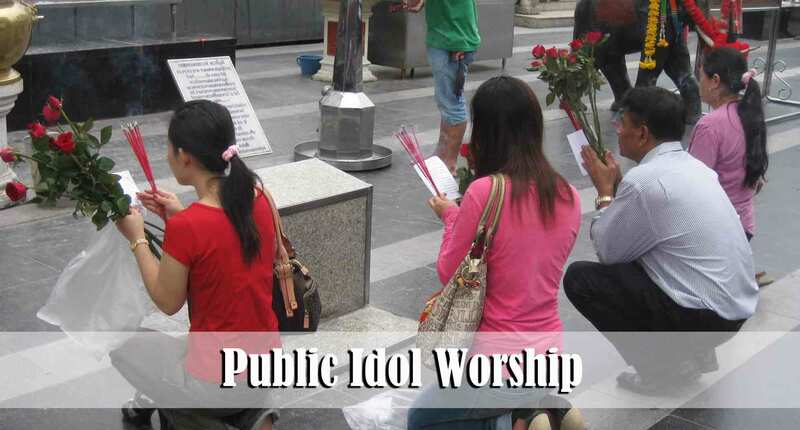 Many people will stop and pay their respects to every idol they pass. 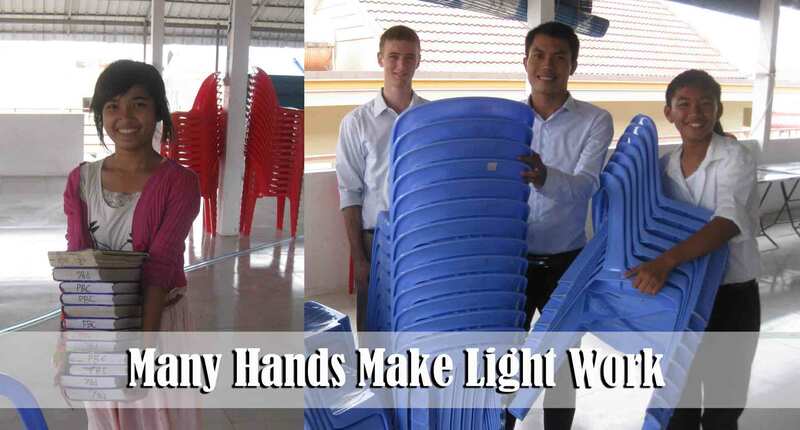 This is something we have never witnessed here in Cambodia. It was a blessing to be able to visit the first church that was ever established in Thailand. 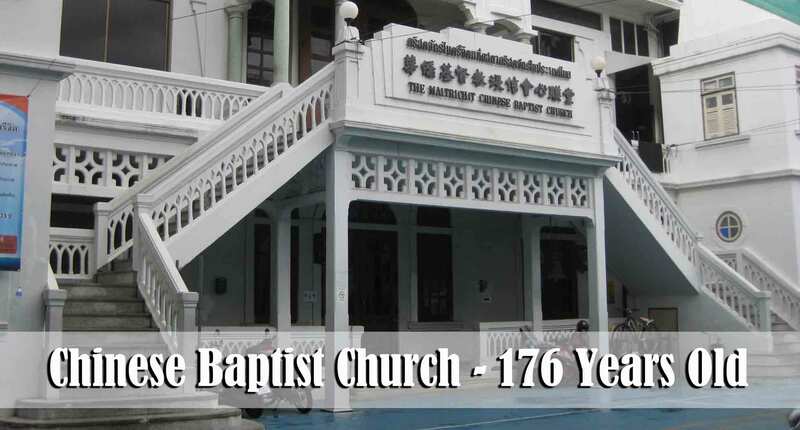 The Chinese Baptist Church is 176 years old and was started by American missionaries. 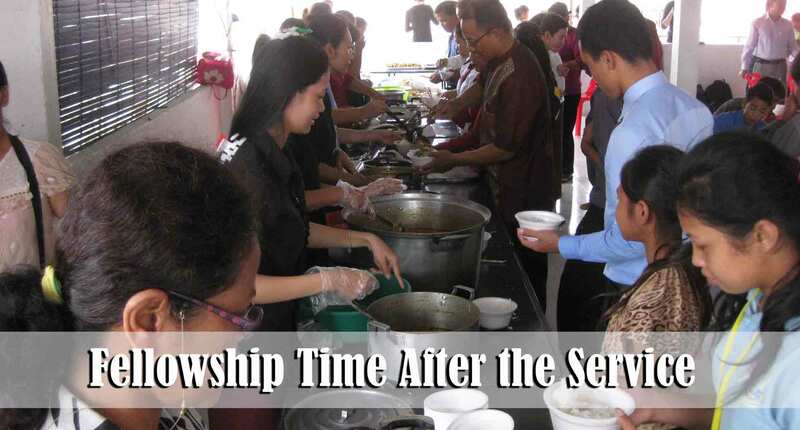 It started out as a very small group of economically disadvantaged Chinese immigrants and has grown over the years to a congregation of over 700 members strong! 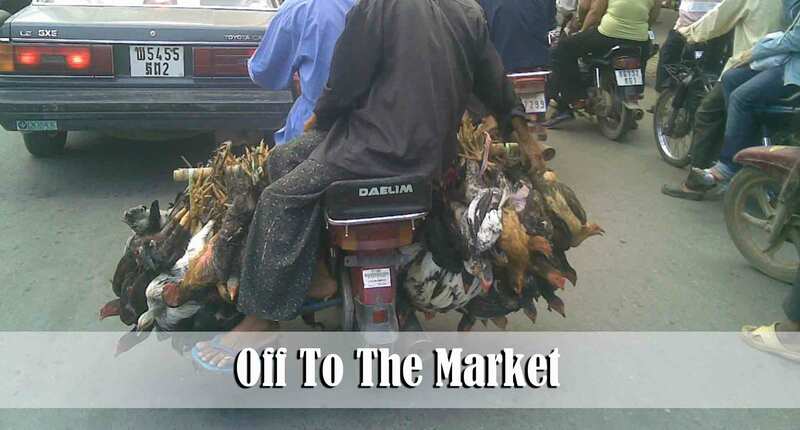 We thought this was an interesting picture taken here in Phnom Penh… These chickens are on the final ride of their life – Headed to the market. 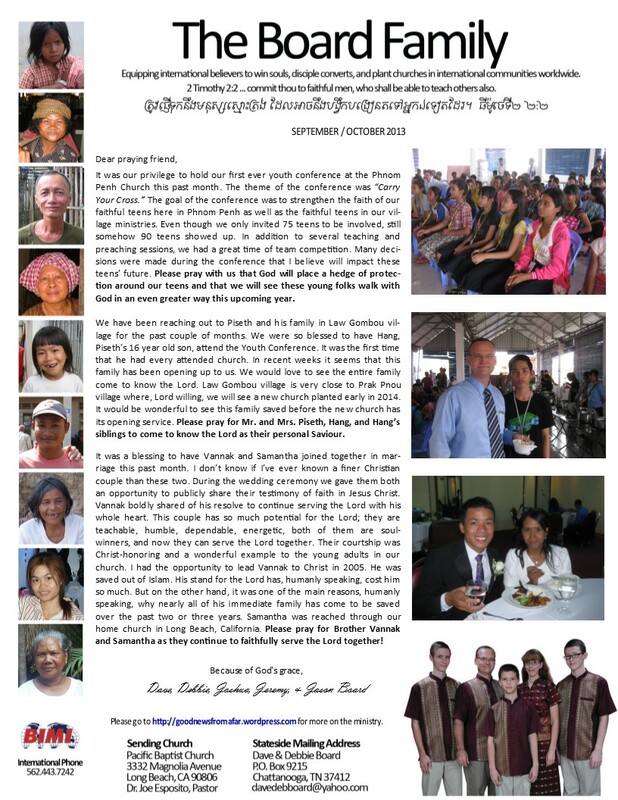 Thank you for your prayers and interest in the ministry here in Cambodia. We wanted to give you an update on the family for whom we asked you to pray a couple of weeks ago. You may remember that Som was admitted to a hospital here in Phnom Penh to be treated for an illness. However, they administered the wrong medicine and she had a serious allergic reaction. Her family took her to a neighboring country in order to seek more competent medical help. The doctors there gave her a 30% chance of survival. The reaction to the medication caused her to prematurely give birth to her baby. The baby was not given much chance to survive either. We want to report to you that God has chosen to heal them both. The family returned to Cambodia on Friday and were in church this morning. Thank you for praying! 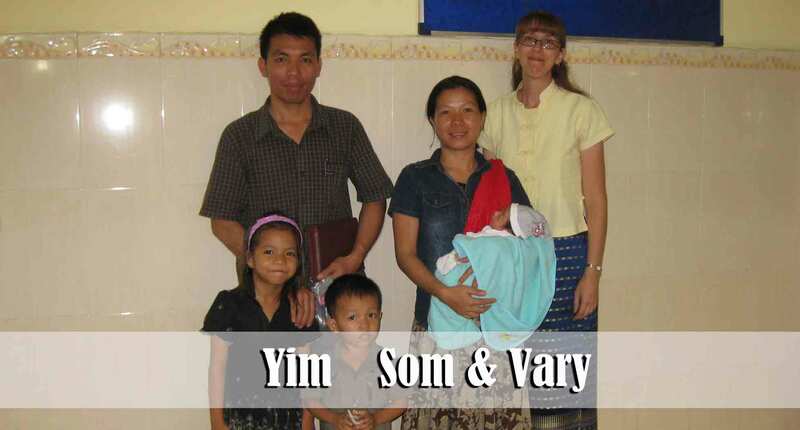 Yim and Som chose to name their baby boy Vary. This is short for Calvary. This morning after the morning service Yim told me that they named him Vary for two reasons: 1) So that when he gets older he will remember that He belongs to God, 2) So that his life will be a reminder of what Christ did for us on the cross of Calvary. Please continue to pray for this family. Srey accepted Christ as her personal Saviour this past year after one of the soul-winners from our church persisted in following up on her and her 12 year-old daughter, Borey. According to her own testimony she cursed the soul-winner and told him that she wanted nothing to do with the church or Christianity. She recently told me that she cursed him in order to see if he truly cared about her soul or if he was all talk. Thank the Lord that Vannak was more than just talk. 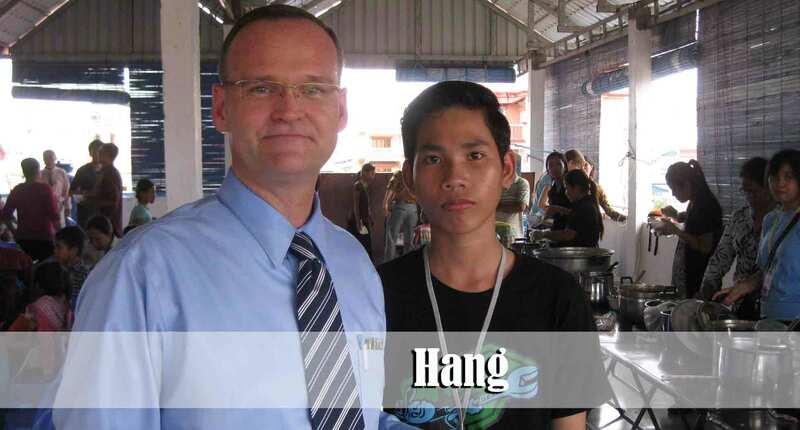 He was not just out handing out tracts because it was one of the “programs” of the church. 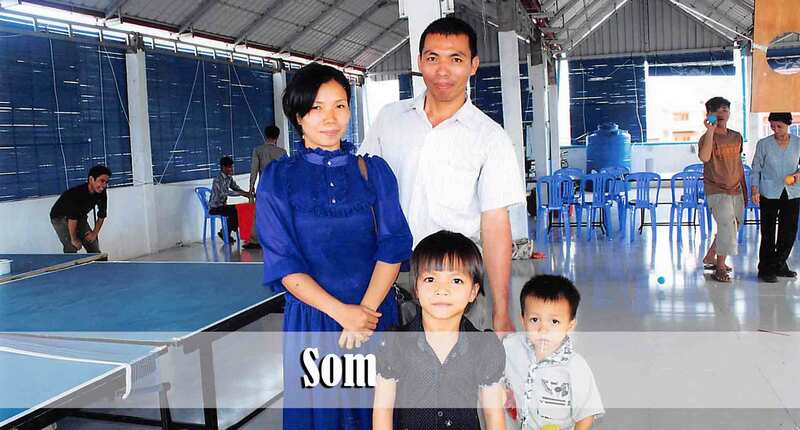 Srey and Borey have been very faithful to church and we have really grown to love this family. Though they are perhaps the poorest family in our Phnom Penh church, Srey would bring our family and others fresh vegetables nearly every week. Two weeks ago Srey became very ill due to problems with her liver. Much effort and expense was taken to try and get her the best possible medical attention. Many of us were involved in helping to meet with doctors as well as finance her medical treatment. After being in the hospital for a few days it became evident that she would likely not be making a recovery. I asked her if there was anything that she wanted me to know in case the Lord took her home. She said there were two things: 1) She wanted a Christian funeral, 2) She wanted to make sure that we would all take care of her daughter. This past Friday we brought her home from the hospital and prepared to have a minimum of two church members with her and her daughter 24 hours a day. 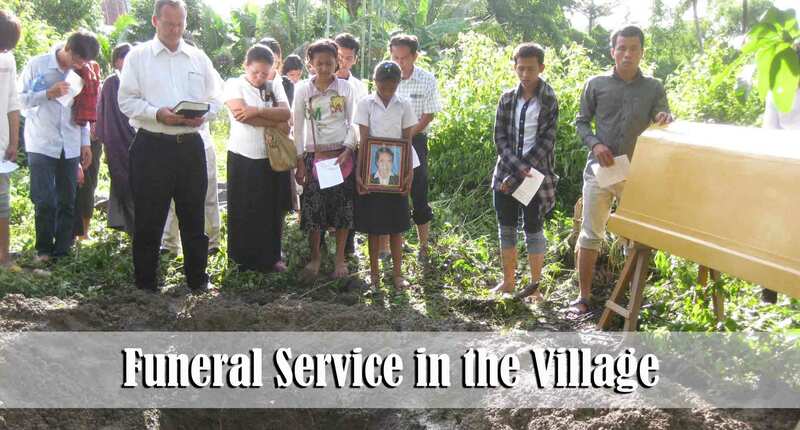 Saturday morning she passed away and by Saturday afternoon she was already buried in her home village in Kompong Cham Province, three hours from Phnom Penh. 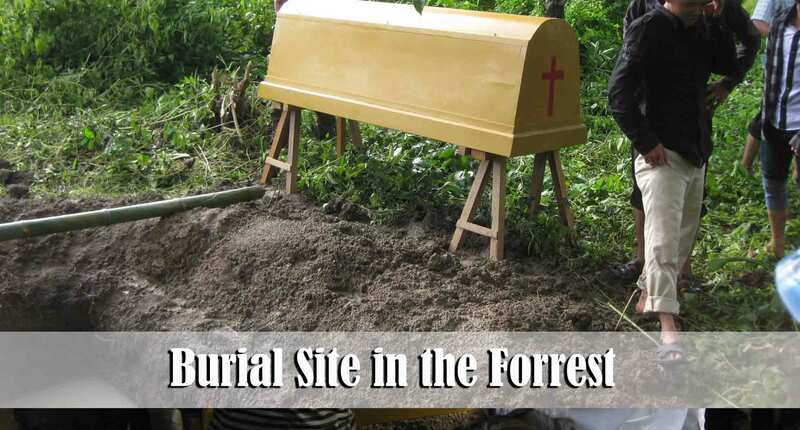 Some of the men from the church carried the casket about 200 yards through the forest to the spot designated as the burial site by the family. This proved to be very difficult due to the fact that it had rained the night before and the ground was very muddy. By the time it was all over we all had nearly two inches of mud stuck to the bottom of our shoes. The entire time that we were doing the graveside service we were also fighting huge ants while at the same time trying not to sink too far into the mud. I still have bites on my feet from ants. We are so blessed to see how so many of the church members jumped right in to do all that they could to help. Please pray for Borey. She is presently staying with Miss Samantha Thaing, a single missionary lady from our home church who is serving with the team here in Cambodia. However, Samantha will be getting married, Lord willing, in the next month or so and some decisions will need to be made regarding Borey’s future. Please pray that we will all have wisdom to know how best to be a blessing to Borey. Also, remember Borey’s father in prayer. His name is Rom. He has not played a very active role in her life due to his problem with alcohol. Before Srey passed away she specifically told me to make sure we take Borey and raise her and not to allow her to go with her father. Srey’s desires are supported by Borey’s grandmother as well. We are not certain what should or will happen in regard to her future living arrangements. For her own safety we are not inclined to send her back home to live alone. We also have to keep in mind that we have three teen boys in our own family and it is not likely that we are in a position to take Borey into our home. So please help pray that we will all have the mind of Christ to discern what is best for all involved. We began going door to door in a small village about 5 miles from our church on the outskirts of Phnom Penh. 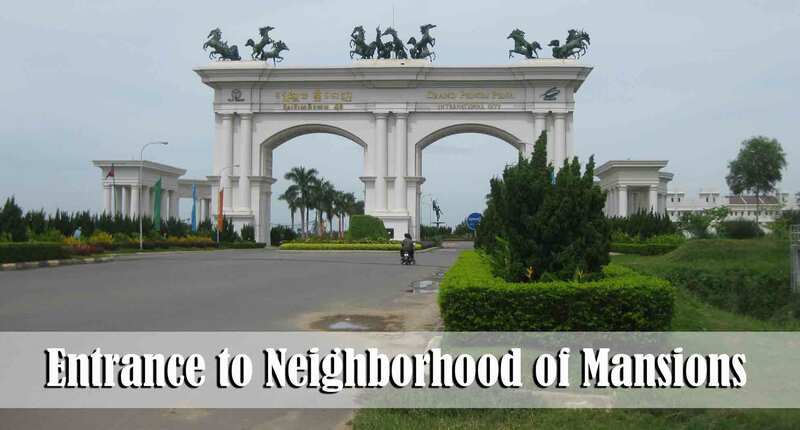 Here you see the entrance to a neighborhood full of townhouse mansions. Last year I actually toured one of the mansions. I am including this picture to show you the wide disparity between the “haves” and the “have nots” here in Cambodia. This is a picture of Law Gomebou village. It is located on the same street as the mansions. Each of the homes in the village look just like these small shacks. 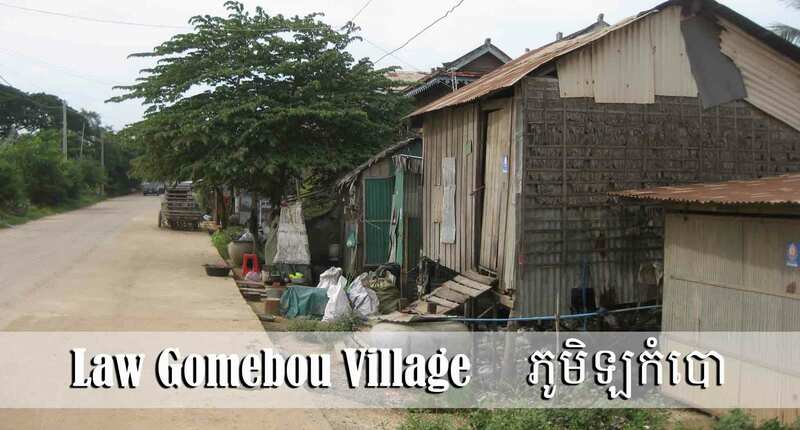 There is no such thing as government subsidized housing here in Cambodia. In fact, most believe that they are poor because of the karma from their “past life.” The rich here often boast that they are wealthy because of all the good things they did in their “former life.” In actuality many wealthy people here in this part of the world are wealthy because of corruption and illegal land-grabbing from the poor and powerless. Please pray for Mr. Peseth and his family of 5 who live in this village. We are presently building a relationship with them and looking to present the Gospel to them as the opportunity arises. We believe they are opening up. Cambodia has many factories that produce textiles that are exported to the United States and Europe. 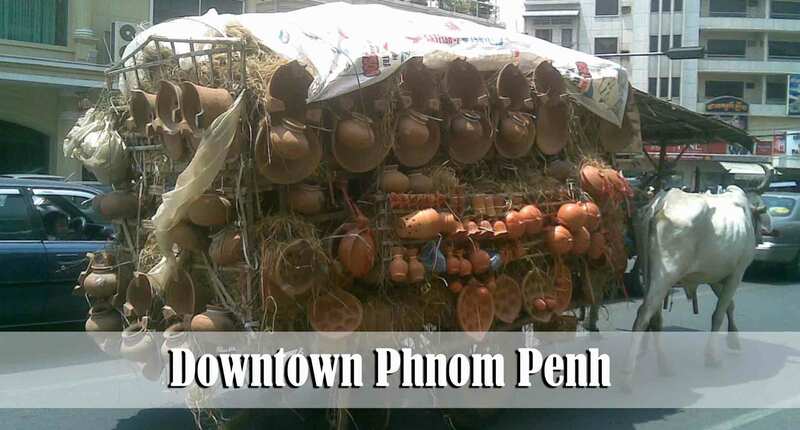 Many times these items are also sold in the stores here in Phnom Penh. A shirt that would sell in the mall in America for $60 can be purchased any day of the week here for $5. 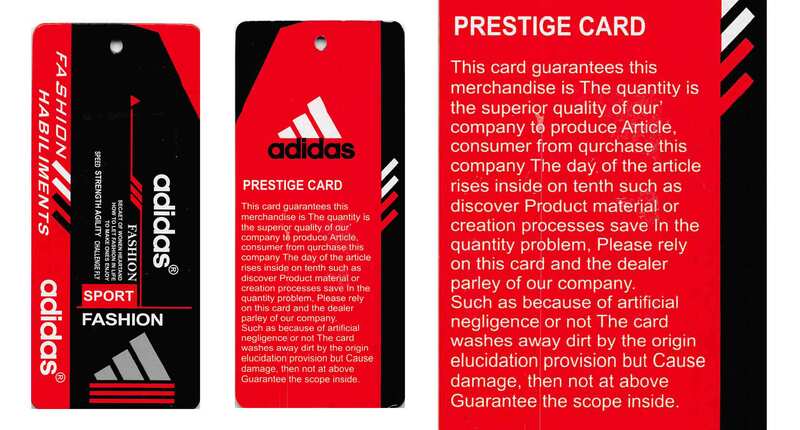 Counterfeit items are readily available on the street as well and it is often difficult to know what is real and what is fake. This past week my sons each purchased an Adidas Dri Fit shirt for $5 each. We are told that the same shirts normally sell for $30 in the States. They assumed the shirts were the real thing because of the quality of the material and the packaging. It was not until they got the shirts home and actually read the tag that we all began to have our doubts that these shirts were made to be exported. What was the thing that tipped us off? Take a moment and read the tag. It has got to be the worst English I have ever read! Just goes to remind us all that not everything that looks real – is actually real!